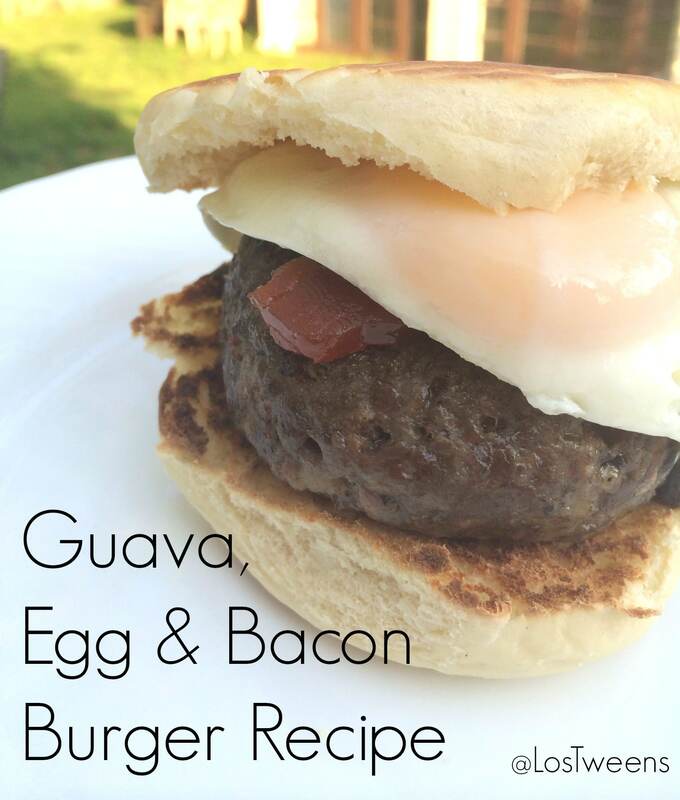 Just in time for summer and world cup, I present the Guava, Egg and Bacon Burger Recipe! As I added bacon to the ground beef, I thought of brunch. Brunch is my favorite meal. On lazy weekends, we lounge around the house sipping on coffee and waiting until after 10 to make breakfast. The kids munch on dry cereal and play or watch weekend cartoons (since we have a weekday ban on television). Beside being able to enjoy every minute of the morning without the rush, I love mornings when we have brunch because it allows me to play with flavors. My favorite flavors: sweet and savory. So when it came to dinner the other night and bacon burgers were on the menu, I thought of how to bring together my favorites. Adding an egg seemed natural but I still needed that sweet flavor I crave. Heading into the refrigerator, I found guava. It became the perfect sweet addition to my burger and an instant hit in my house. Put the bacon into a food processor and run until bacon is in small pieces. (You can run it through a meat grinder as well.) Add bacon to the ground beef, season with salt and pepper and make into patties. Place burgers on a hot grill. While burgers are cooking, cut guava into 6 thin slices. Once burgers are cooked to the desired temperature, top each with a slice of guava and tent with aluminum foil while frying eggs. Heat oil and cook the eggs leaving yolks runny. Place the burgers topped with guava on to a bun bottom, top with an egg and serve. Let me know if you try the recipe and how it turns out! Happy summer and happy World Cup Season! This entry was posted in Recipes and tagged bacon, burger, cooking, egg, Food, guava, recipe, summer, world cup. Bookmark the permalink.